Managing symptoms during perimenopause and menopause does not have to be an all-consuming task. 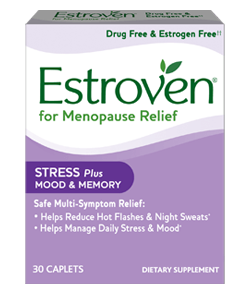 Estroven is here to help with some tips and tricks to help manage your most bothersome menopause symptoms. Simply incorporate a few healthy changes in your lifestyle to help in your overall well-being. Now is the perfect time to begin! Hot flashes and night sweats are common symptoms of menopause and they seem to come out of nowhere. Hot flashes can happen when you’re relaxing at the end of a tough day, sitting down to a romantic dinner, or even when you’re just sitting quietly reading a book. The hot flashes start and your hormones show you no mercy. However, there are many things you can do to ease the battle against hot flashes and night sweats, while staying comfortable. Dress in layers for quick stripping of layers, choose fabrics that breathe and allow air to circulate, and lose the pantyhose whenever possible. Try some long, even breaths. Count to four on the inhale, and pause. Exhale to the count of four and pause. Repeat for 10 full breaths. Avoid caffeinated beverages and alcohol. No kidding, they can make you hot. And take it easy on greasy food, too. 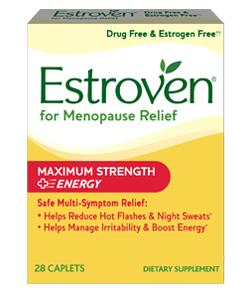 Find the right Estroven product for you. If the natural approach is still not offering relief after 60 days, discuss other options with your doctor. Staying physically active and managing your weight can help reduce your menopause symptoms, including mood swings and hot flashes. Healthy diet and exercise is key, but there are many other simple tips you can incorporate into your daily routine. You already know that eating right is key to maintaining lifelong health. This is particularly true during menopause. More than ever, you need a balanced diet that focuses on healthy foods, and reduces consumption of alcohol and caffeine. Hot flashes and night sweats are less common in physically active women. Physical exercise can enhance mood, promote daytime energy, and help sleep. Being fit also decreases the long-term risks of cardiovascular disease, osteoporosis, and obesity. Get a pedometer and see how many miles you can log each week. Just taking the stairs instead of the elevator can get your blood? pumping. Park a few blocks from your destination. This is an easy way to fit some walking into your day. Make cleaning work for you! Clean the house by the longest route – go up a flight of stairs and do one room; then down a flight and do another, etc. Incorporate exercise into other activities. Keep some light weights at your desk or install an exercise bike or rowing machine in front of your TV. It's easier to accomplish your goals if you start with a plan. Decide what you're looking to achieve and how you want to achieve it. Put it on your calendar, or ask a friend to work out with you. Remember it only works if you stick to your plan! Difficulty sleeping is not uncommon when going through menopause. Almost 61% of menopausal women have experienced sleep problems, according to the National Sleep Foundation. 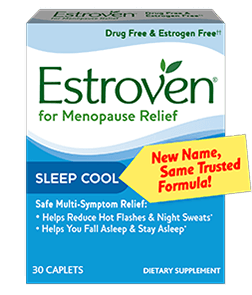 Night sweats, snoring, sleep apnea, hot flashes, and anxiety associated with menopausal women makes falling asleep or staying asleep more difficult. Next to you, no one knows your health better. Plus, it’s always good to rule out other causes of sleeplessness, such as sleep apnea, depression or anxiety, which can and should be medically treated. Cut out the evening snack. Digesting large meals or even salty snacks can disrupt your sleep patterns. Try to eat an evening meal at the same time every night, and give yourself at least three hours before laying down to sleep. It sounds obvious, but try to reduce your intake of anything with caffeine or other stimulants after 2pm. Avoid alcohol before bedtime. You may think it makes you sleepy, but it actually increases the chances you'll wake up during the night. Exercise increases metabolism, can help you relax, and yes, it wears you out, so you may fall asleep easier and stay asleep longer. Meditation or yoga before bed can help reduce stress, a major cause of sleeplessness; it has been shown to increase production of melatonin, which promotes sleep naturally. Whether it’s cotton pajamas, a favorite nightgown or a big t-shirt, always wear what makes you feel the most comfortable. But be sure to choose lightweight, natural fibers that "breathe" — especially if you experience night sweats or hot flashes during the night. Eat healthy and maintain a normal weight. Also, avoid foods that may trigger hot flashes and night sweats such as spicy or acidic foods. When you go to bed at night, your bedroom should be dark, cool and quiet. Establish a sleep routine with regular bedtime and wake-up schedule. Don’t take on more obligations than you can handle. Try not to cope with problems by using alcohol, caffeine, or cigarettes. Make sure you get the facts about menopause from your healthcare professional before deciding how you want to manage it. 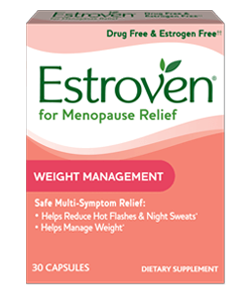 Consider Estroven as your first choice for handling your menopausal symptoms. If you continue to have problems, speak with your doctor about alternatives. Psychotherapy, counseling, support groups, and social media can also be helpful. Talk with your health care provider to discuss the best action plan for you.